I'm sure you saw this coming! 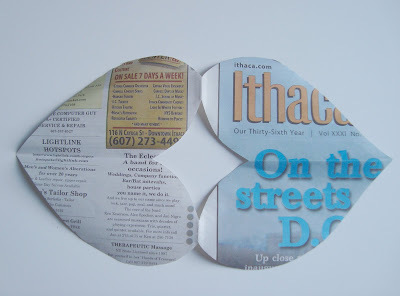 Valentine's Day is another wonderful opportunity to make newspaper bunting. An I LOVE YOU banner really sets a nice mood. My children were squabbling. I pointed to the hearts. My big guy moaned "Mom! ", but they stopped and were actually quite kind to one another without me saying a word. I might have to leave this up for a while. So, if you'd like to hang some hearts of your own, here you go! 1. 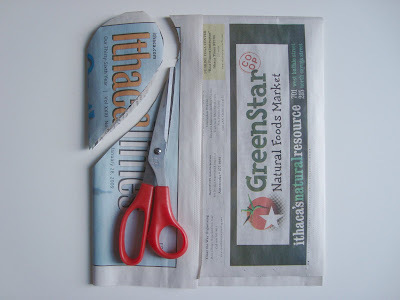 Position newspaper so that the fold is at the top. Fold over and cut out a half heart leaving a tiny portion at the top rounds of the heart uncut. 2. Cut out enough (double)hearts to spell your sentiment. 3. 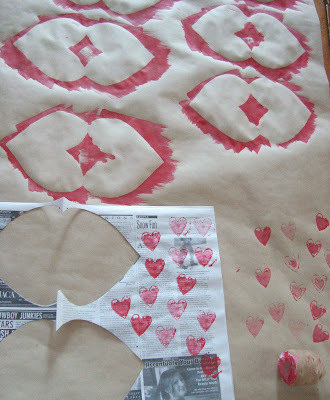 Spread out hearts on brown paper and paint with your color of choice. 4. Let dry and iron flat before painting on letters or hanging over ribbon. Refer to these instructions for more details. Look what I discovered when I peeled off my dry painted hearts from the brown paper! In keeping with my love for using every bit of something, I immediately cut out my surprise hearts... I'll show you what to do with those in a future post. 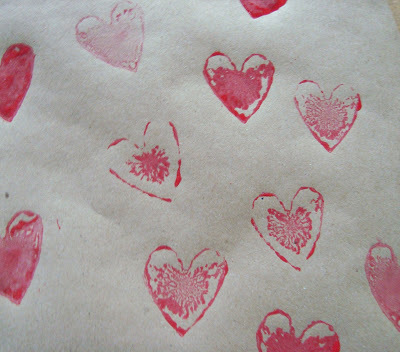 Since I had my red paint out, I decided to stamp a few more little hearts like the ones here. I had used a potato stamp a few days earlier. My husband asked me each night if he could put the potato in the compost. For some reason, I resisted. Well, do you know the magic that happens to a potato stamp that has been left out to dry for two nights!! I do, now! The carved part shrinks. The outline becomes raised in a ridge. The middle grows concave, except for the direct center, which becomes lacy. I think it's beautiful! I stamped a bunch on newspaper also... which leads me to my second newspaper bunting, which is my favorite. It's made from the stamped and cut out newspaper hearts, and looks perfect everywhere. I machine sewed through each heart just like my snowflake garland. I used white thread for the bobbin and red for the the needle. In the spaces between the hearts, it looks like a wispy strand of baker's twine. Love that! I brought it over to the barn with a present for my mother, her new inspiration board that she had requested for her sewing corner. If you'd like some more heart bunting inspiration, click right over to Pascale's at //between the lines// or over at wild olive's bunting. 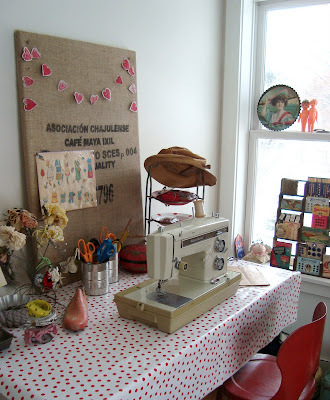 Rachel has a series of round-ups of Valentine's crafts at One Pretty Thing. I really want to thank everyone who has left a "love" comment on the weekend give-away. I had no idea what to expect. I feel like I know each of you a little more intimately... a tiny bit deeper, and I'm so very lucky. It's hard to read through them all and not feel filled to the brim and ready to spread more. Happy making on this first Monday of February! 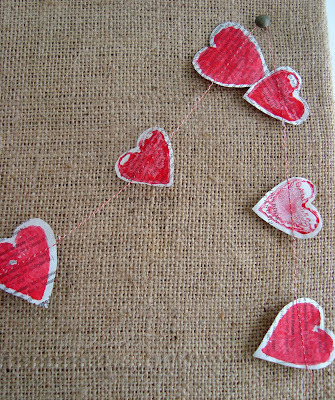 I love your happy accidents with the craft paper hearts, the potato stamp, and the faux "baker's twine" effect. I say always trust your intuition! Hola! Thank you for all the inspiration you always provide me with, thank you for being so generous with your talent and art -I really appreciate it! I just happened upon your blog a couple of weeks ago and am in love! Your ideas inspire me and are a great reminder to start planning early. Your name is lovely (same as my 3 year old) and I am excited to check in regularly for creative inspiration. 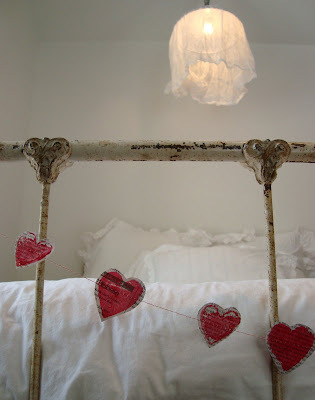 The love garland across the bed is so romantic and nostalgic. I LOVE what you do with the humblest of materials Maya! These garlands are just LOVELY! 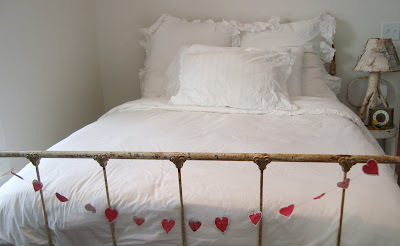 And that picture with the hearts across the bed frame: you should put it into print - it's THE perfect Valentine's card!! I love it!! Everything you touch always looks so LOVEly Maya. It is all the special little details and your deep love for the environment that make it oh so special. Your mom is so blessed to have you as her interior decorator. What a good idea and just in time. We've been in the 'thinking' mode of valentine day creations, but the 'doing' mode is lacking. Maya, I need one more life just to be able to do EVERYTHING you share here. I love this!! I don't know how but I found you and I'm enjoying your blog very much...I love this particular craft which I think I'll make this week with my girls.Thanks for sharing. Beautiful pictures by the way. could your stuff be any cuter? i think not. thank you for sharing. These are wonderful! I love your newspaper bunting technique, and this is such a lovely application. Thanks for sharing! So very beautiful Maya! You are so very inspirational my dear and as I have said before....completely magical! Thank you! I loved these and had to make some today! I linked to you so that others could enjoy preparing for *heart* day! I love the negative space of the hearts...they look a bit like lips don't they? Did you say that these garlands can stop kids from bickering? Oh, we need to make these garlands! Seriously though, they're darling and beautiful, like everything else you create. Thank you! 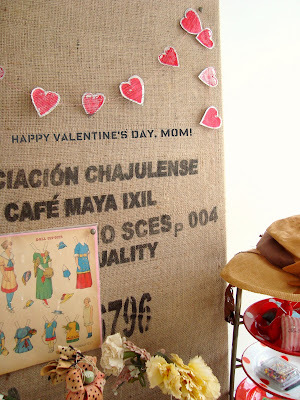 bale of 500 burlap coffee bags. thought you'd giggle. I love the bunting and excellent instructions so we can make our own. Great idea!!! Now I have more inspirations for my Valentine fever! I just found you & I love you! How's that for forward?! :) I cannot wait to wade through archive & get crafty! Thanks for sharing your ideas...I am in love with all the bunting so far. This is why I have saved all those scrims and scraps of stuff! I made this yesterday with my 2 and 3 year old girls. We had a blast! Just one question, did you stamp your letters, they look so well done? We will just have to print, but that's OK.
smart maya and cute maya. Thanks Maya for the great idea. I went out the day after to get paint and we made ours. I've been admiring your bunting for months now and finally decided to make some of my own. It was fantastic! I have a new found love for newspaper. Thanks for all the inspiration you provide! I love your newspaper garlands. so pretty and "simple". 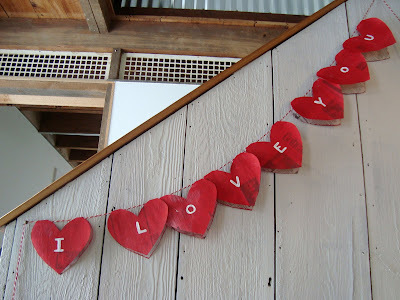 i made a heart garland that is similar, and linked to your blog from my entry about it. hope that is ok! I was looking for instructions on newspaper bunting when I found your blog. And I had to laugh. Because my husband cannot STAND my crafting stuff laying out. I doubt he would have asked about a potato stamp, it would have been in the garbage already. :D Love these garlands, I`m going to be doing the big one with my toddlers today. Love them...thanks so much for the information. I must try them out too! Just wanted to let you know, i tried your newspaper bunting idea and made one that spelled LOVE.. I posted about it on my blog, but I couldn't remember what blog i had seen it on.. I still have to locate the picture i took of it and add that to the post, so i'll give credit for where i found it then..Thanks for the idea. I made this pretty harts with my daughter yesterday. She loved making it and was very proud when we hung it at her bed. It looks really pretty!!! 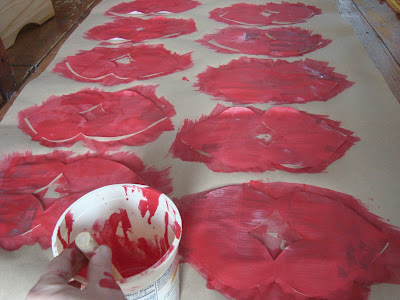 I'm making this in stages since I have a very active 18 month old that doesn't give me much time to create at home. I "borrowed" newspaper from our recycling bin at my office today and cut out my hearts. Friday during his nap I'm going to paint, etc. and will hopefully be finished and up when he wakes up. Now if he will only give me a 2 hour nap, I might be able to accomplish this task. So much for dusting and sweeping - I'd rather craft. Next up, I'm breaking out my sewing machine. Thankyou so much for inspiring us! This project was completed with my daughter Maya yesterday, and I felt so excited as it was the first time I had used my sewing machine for years! It looked much better than I hoped - what an encouraging start to hopefully some more creative outputting (that's probably not a word). Thanks again. Hello I am so glad to find you again! As the snow falls sideways, I am immersed in cleaning files on my laptop and -- there you were -- love this post --I will be sure to book mark this time!